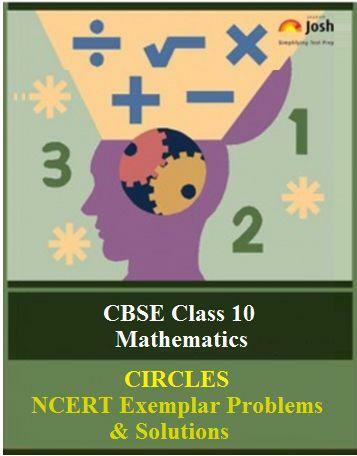 Get here the NCERT Exemplar Problems and Solutions for CBSE class 10 Mathematics chapter 9- Circles (Part-IIIA). This part consists of Short Answer Type Questions. Solutions to question number 1 to 5 form exercise 9.3 of NCERT Exemplar for Mathematics chapter 9 are available here. Here you get the CBSE Class 10 Mathematics chapter 9, Circles: NCERT Exemplar Problems and Solutions (Part-IIIA). This part of the chapter includes solutions to Question Number 1 to 5 from Exercise 9.3 of NCERT Exemplar Problems for Class 10 Mathematics Chapter: Circles. This exercise comprises only the Short Answer Type Questions framed from various important topics in the chapter. Each question is provided with a detailed solution. is a tangent to the inner circle. Find the radius of the inner circle. Let C1 and C2 be the two concentric circles with centre at O. Radius of outer circle C2 is 5 cm. AC is a 8 cm long chord which touches the inner circle C1 at point B. Question. 2 Two tangents PQ and PR are drawn from an external point to a circle with centre O. Prove that QORP is a cyclic quadrilateral. Question. 3 Prove that the centre of a circle touching two intersecting lines lies on the angle bisector of the lines. Given: Two tangents PQ and PR are drawn from an external point P to a circle with centre O. To prove: Centre of a circle touching two intersecting lines lies on the angle bisector of the lines. Construction: Join OR, and OQ. Thus, the centre O lies on angle bisecter of PR and PQ. Question. 4 If from an external point B of a circle with centre O, two tangents BC and BD are drawn such that ∠DBC = 120°, prove that BC + BD = BO i.e., BO = 2BC. Construction: Join OC, OD and OB. Given: AB and CD are common tangents to two circles of unequal radii.